This photo shows the Aghadoe Crozier, a beautiful 12th century artefact found at Aghadoe, County Kerry in 1848. 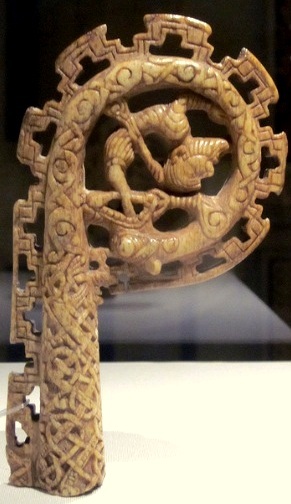 The crozier is intricately carved out of walrus ivory and is decorated in the Viking Urnes style. It also contains some features which are paralleled on the portals of the Early Medieval church at Aghadoe. The crook appears to have been shortened in antiquity but apart from this it is in remarkably good condition. The stem of the crozier bears zoomorphic ornament which eventually turns into a foliage pattern[i]. The crook then curves and becomes the forepart of a monster/dragon that has a man either entering or leaving its wide open jaws. This may be a depiction of the biblical story of Jonah and the sea-monster. The crozier can currently be viewed at the National Museum of Ireland, Kildare Street, Dublin. 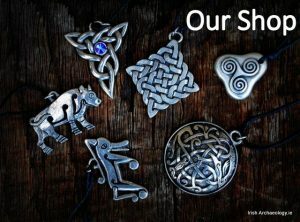 [i] Henry, F. 1970 Irish Art in the Romanesque Period (1020 to 1170AD), Kent. It is very unlikely that the ivory is Walrus. See http://en.wikipedia.org/wiki/Walrus for sizing. If it is ivory then the http://en.wikipedia.org/wiki/Narwhal would seem more your man. Why it couldn’t be Elephant though. Has it been tested. I see little reason to perpetuate the myth that contact with Africa was rare. Be assured, likely one of the first tests they ran was on the ivory. Why would one not think it was Walrus Ivory? Walrus were common along the shores of the North Atlantic even along the Irish Coast until the late Roman period and still abundant along many North Atlantic shores…and why would you think it was Narwhal irovy from which is not very good for carving …I say this as an experienced carver of ivory (legal, fossil ivory I might add). The natural history of the North Atlantic was up until the 16th Centrury and beyond a very rich and abundant habitat supporting vast numbers of sea mammals, fish and birds, almost all of which have been so severely depleted as to appear to be nothing more than mythological. The white marine bear, which we now call the polar bear, was only a couple of thousand years ago plentiful even as far south as the coast of Portugal and eagerly sought after by the Romans. We call them Polar Bears now because the polar region is the only region where hunting them was impossible. Cheerio. 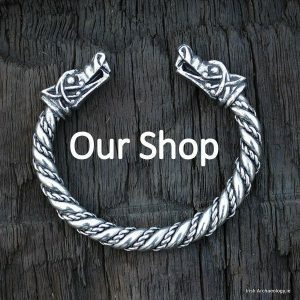 I’m doing a project on Viking trade and would love to use this picture. I was just wondering what the copyright rules are surrounding it? Thanks!